Carla Peperzak speaks at a lecture at Fairchild Air Force Base in 2017. Once Spokane Public Schools builds the three new middle schools voters recently approved, the district will have another challenge: naming them. State Senate Majority Leader Andy Billig (D-Spokane) has thrown in one suggestion for one of the middle schools. In a letter to the school board, he asks to have a middle school named after Carla Peperzak, a teenage Jewish member of the Dutch resistance during World War II who rescued Jews during the Holocaust. "I believe naming a middle school for Carla is appropriate to honor her heroism and service," Billig writes. 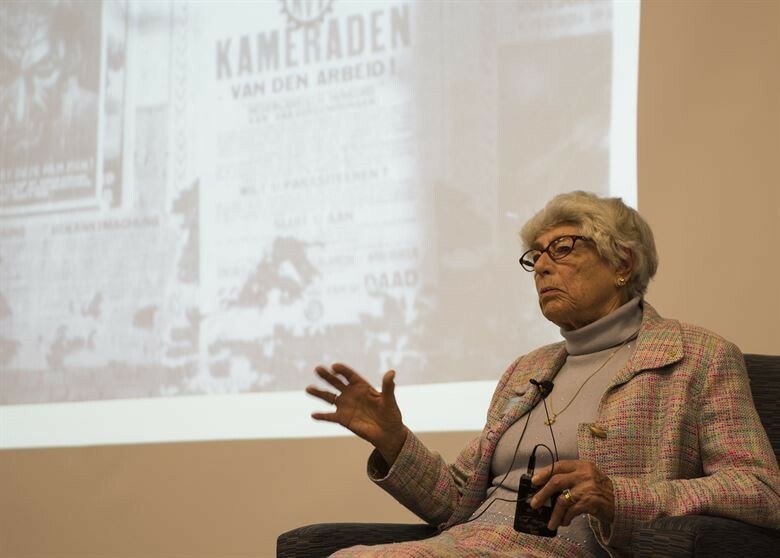 Peperzak, who moved to Spokane in 2004, has estimated that she rescued 40 Jews from the Nazis during World War II. She's a frequent public speaker in the community and educates students about the Holocaust. In 2015, the state Senate passed a resolution honoring her. As part of the school bond the district passed in November, Spokane Public Schools will be constructing three new middle schools in the coming years — for now, they're being called the Northwest, Northeast and South Hill middle schools. The district hopes to name the schools by spring of 2020. Under the school district's policy, names of schools can either be a prominent geographic feature, a "significant individual or event," or some other logical association having to do with location or function. Billig argues it makes sense to further honor Peperzak by naming a middle school after her. "It is vital to continue to tell the story of the Holocaust to future generations and seems particularly fitting to tell that story to middle school students through the lens of a teenage hero who ended up living right here in our own community," he says. Washington's tax system disproportionately impacts middle and low-income families. Could state lawmakers change that this year?